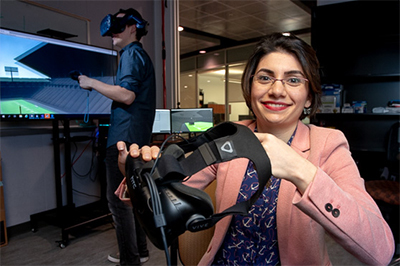 When Elham Ebrahimi, an assistant professor in the Department of Computer Science, peers through a virtual reality visor, she sees more than a game on a digital screen. She sees a technological tool with the potential to revolutionize healthcare training and treatments. NEW: Join ETEAL and OSLE for a Community Partnership Event Today at 4 p.m. Submit items for the next SWOOP by noon Friday. Please Note: SWOOP will NOT be distributed on March 12.